Email Signature – Workspace 365 - How can we help? As an organisation, you want to be consistent in your communication to the outside world. We make this easier with the new managed email signatures, which admins can create for everyone within the organisation. For the organisations who don’t use managed email signatures, we have made it easier to set up and edit personal email signatures. Before, this had to be set up on the user’s profile page. Now, it’s possible to do this in the place where you actually create and send your emails: in the Email app. This way, you can quickly edit your email signature while you’re working in your emailbox. 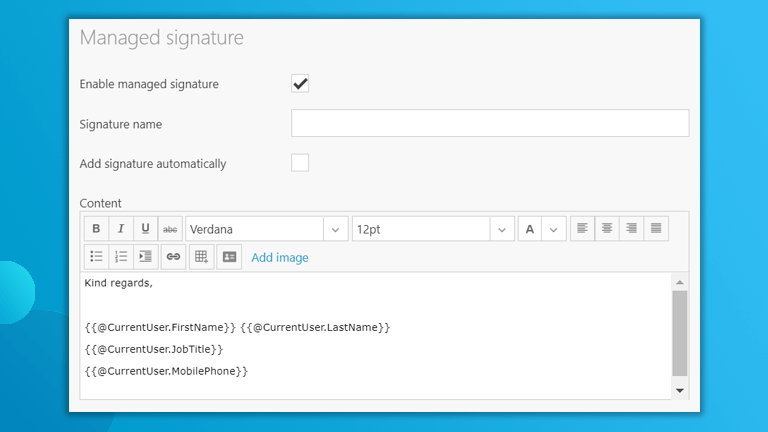 You can choose to set the default signature, disable the signature of edit your current signature. The admin can easily create email signatures with the help of placeholders, such as First name, Last name and Email address. These will automatically replaced with the information of the specific user from Workspace 365 or from the (Azure) Active Directory. Also, the admin can add images, such as the company logo. Subsequently, the format of the email signature is the same for everyone in the organisation and everyone is sending the correct information with his or her emails. Via the “ID card” icon in the toolbar, you can add placeholders which will be replaced with dynamic information of the user from the Active Directory. If syncing with AD is not enabled, information is used directly from the workspace.